Saturday 20th April at 9:00am. Located at Grange Recreation Ground . 5km Parkruns are held at 9am every Saturday of the year and are free but please register at www.parkrun.org.uk before your first run. The event starts on the beautiful Greenway looking down over Radwell Meadows. Monday 22nd April at 11:00am. Saturday 27th April at 9:00am. Saturday 4th May at 9:00am. Monday 6th May at 11:00am. Saturday 11th May at 9:00am. Monday 13th May at 11:00am. Saturday 18th May at 9:00am. Monday 20th May at 11:00am. Saturday 25th May at 9:00am. Monday 27th May at 11:00am. Saturday 1st June at 9:00am. Monday 3rd June at 11:00am. Saturday 8th June at 9:00am. Monday 10th June at 11:00am. Saturday 15th June at 9:00am. Monday 17th June at 11:00am. Saturday 22nd June at 9:00am. Monday 24th June at 11:00am. Saturday 29th June at 9:00am. Monday 1st July at 11:00am. Monday 8th July at 11:00am. Sunday 14th July at 10:00am - 4:00pm. 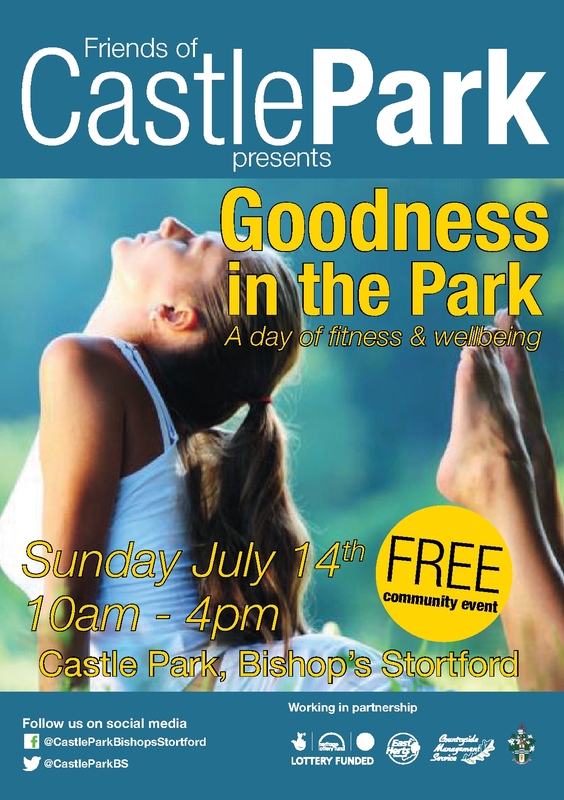 The Friends of Castle Park present Goodness in the Park. This free event takes place on Sunday July 14th from 10am -4pm. Come and take part in a range of activities to exercise your mind, body and soul. Monday 15th July at 11:00am. Monday 22nd July at 11:00am. Monday 29th July at 11:00am. Monday 5th August at 11:00am. Monday 12th August at 11:00am. Monday 19th August at 11:00am. Monday 26th August at 11:00am. Monday 2nd September at 11:00am. Monday 9th September at 11:00am. Monday 16th September at 11:00am. Monday 23rd September at 11:00am. Monday 30th September at 11:00am. Monday 7th October at 11:00am. Monday 14th October at 11:00am. Monday 21st October at 11:00am. Monday 28th October at 11:00am. Monday 4th November at 11:00am. Monday 11th November at 11:00am. Monday 18th November at 11:00am. Monday 25th November at 11:00am. Monday 2nd December at 11:00am.